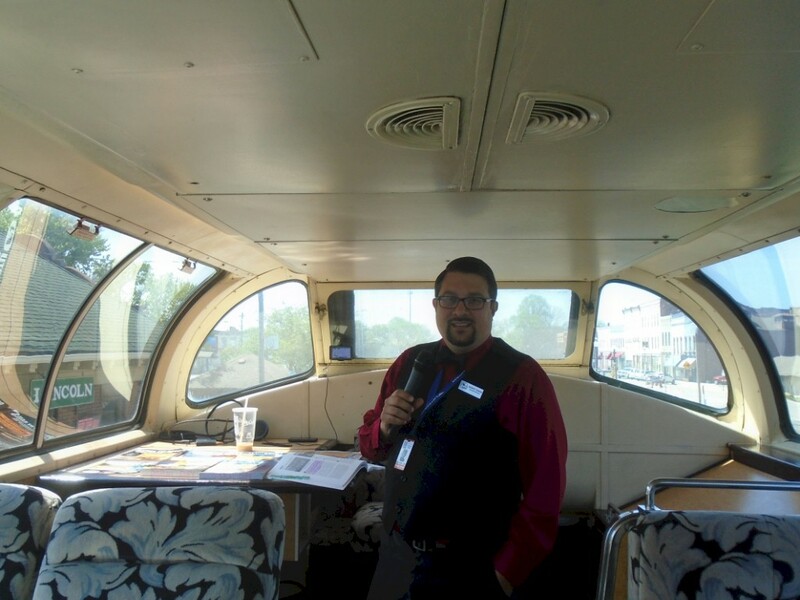 For the past year now, the two of us (Robert and Kandace) have managed the American Passenger Rail Heritage Foundation’s Rail Rangers program. 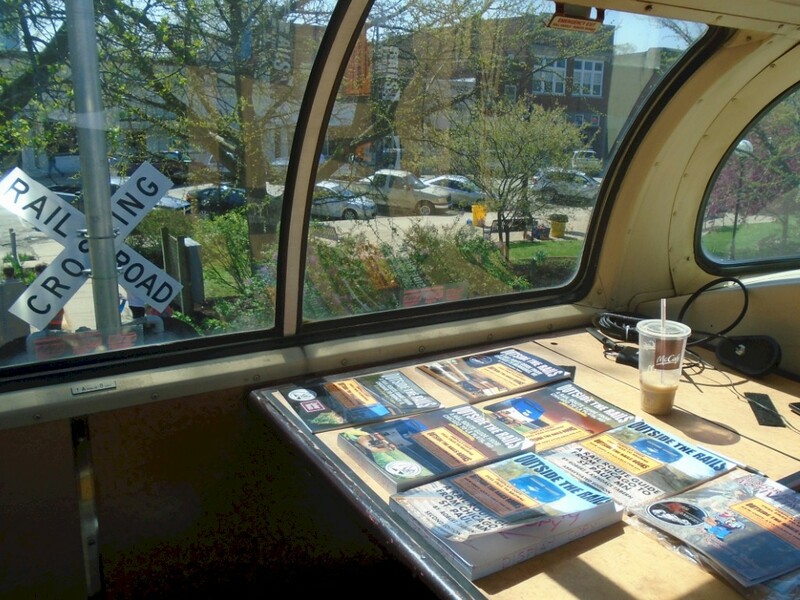 We narrate and provide route guidebooks for select private railcar excursions out of Chicago. Our group of now nine volunteers got its roots from the Trails & Rails program that operated on the Southwest Chief between Chicago and La Plata, Missouri between May 2013 and July 2015. 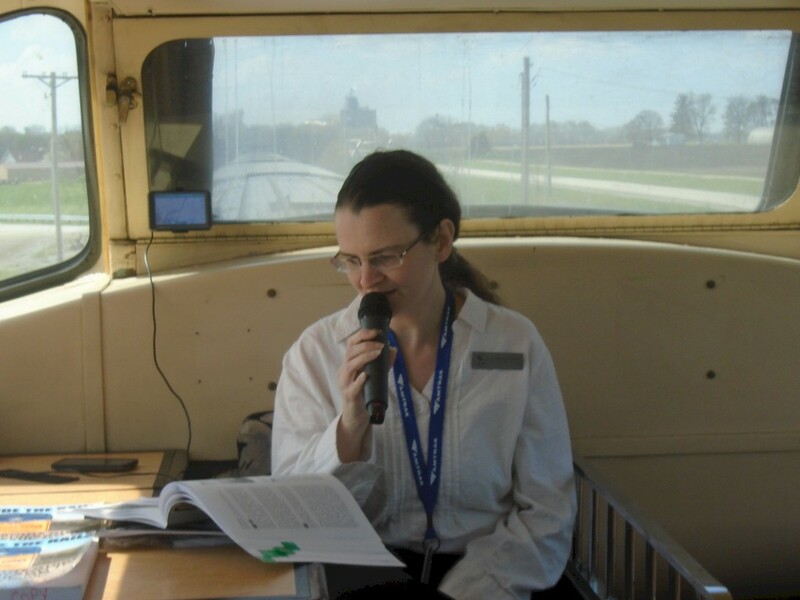 However, now instead of just being limited to one Amtrak route, APRHF Rail Rangers volunteers narrate on various passenger rail lines across the Midwest. Rail Rangers is under the direct control of the American Passenger Rail Heritage Foundation’s Board of Directors, instead of being overseen by Amtrak and the National Park Service. Shortly after starting the APRHF Rail Rangers program in July 2015, we got word of a possible private rail excursion taking place in Spring 2016 between Chicago and Saint Louis, Missouri. Even though we both have ridden the rail line several times before, we really hadn’t done much research on this particular route. So, before the first flake of snow began to fall last winter, we drove part of the route to learn about its history. This expanded into three weekends of driving portions of the 284-mile route across Illinois. One weekend we drove from Chicago to Joliet… the next weekend we drove from Joliet to Springfield… and the final weekend we drove from Springfield to St. Louis Gateway Station. As we have done with other routes, we drive as close as possible to the tracks and take our time – stopping in various local museums, chambers of commerce, and even stopping off at folks’ farms and homes to hear their hometown stories. Driving the route from Chicago to St. Louis was relatively easy compared to other routes, since much of the rail line is paralleled by old U.S. Route 66, and present-day Interstate 55. The Sears Tower (on the left in the above photo) can be seen just after leaving Chicago from private car "Sky View"
We got up early on the morning of Saturday, April 23rd and drove from our house in Wadsworth, Illinois to Chicago Union Station. Around 8:00am we met up with our fellow APRHF Rail Rangers Interpretive Guide, Robert Neil. He lives in Des Plaines, Illinois, and came in on the Union Pacific (ex-CN&W) Northwest Metra Line. 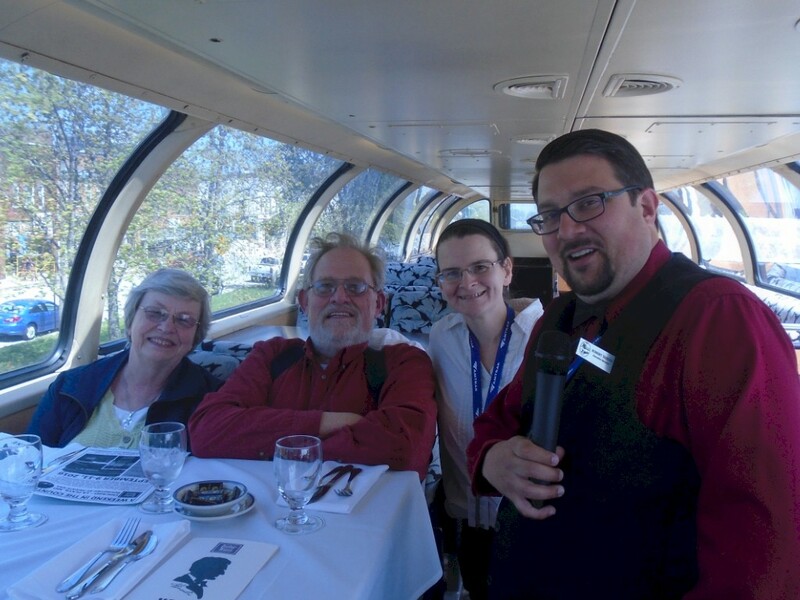 We also met up with Mike Abernethy, the President of Zephyr Route, which was chartering the dome car that we were riding on. If you are not familiar with Mike and Zephyr Route… there is an interesting story there. Even though he was a school teacher most of his life, Mike started out working for the Burlington out of Chicago. In the past decade or two, he decided to purchase private railcar Silver View (an ex-CB&Q round-end observation/dome car). He keeps it out in northeast Iowa where it is undergoing restoration. 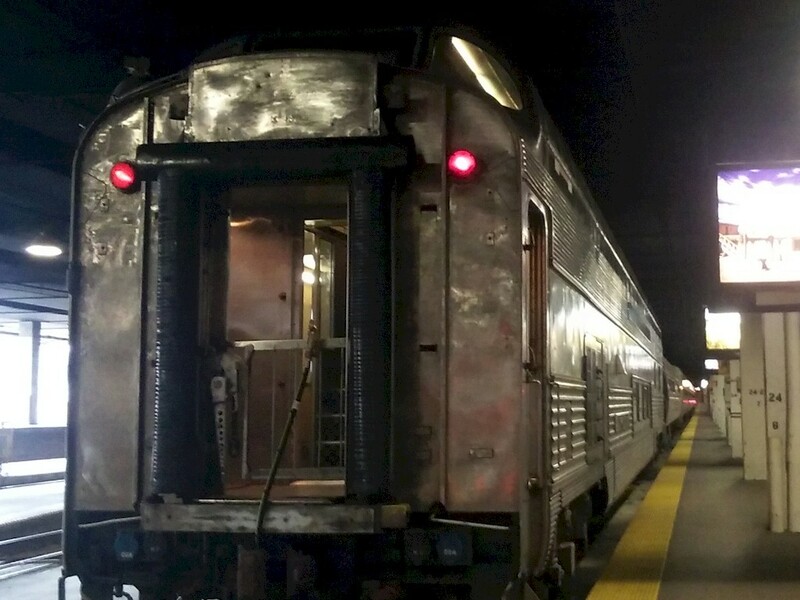 In order to support his restoration efforts, he charters private railcar trips around the Midwest and uses the profit made for items he needs to re-build Silver View. Mike was one of the original charter partners in the APRHF Rail Rangers program. 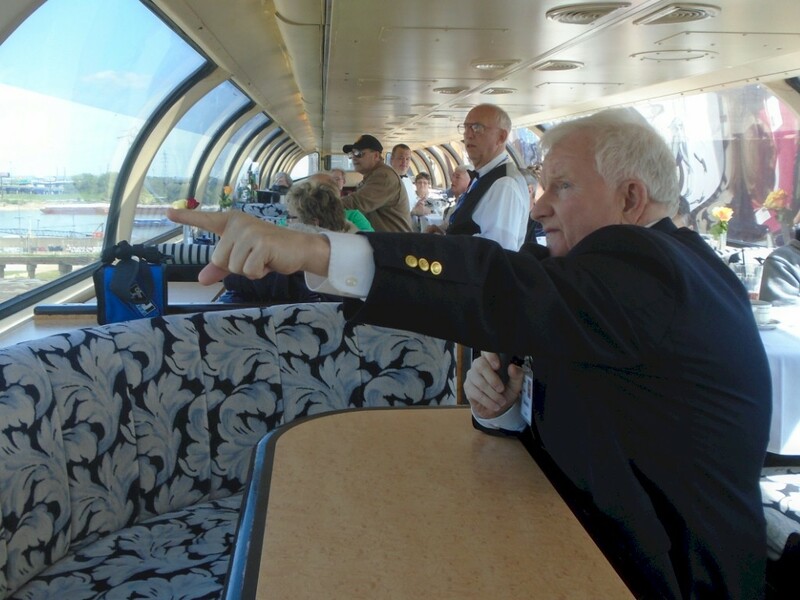 In fact, Mike let us do a “test run” of APRHF Rail Rangers in June 2015 on one of his trips to Hannibal, Missouri, even before the program officially had a name or was announced to the public. Mike often charters his cars from Iowa Pacific. His car of choice is often “Prairie View”, however for this trip it was out in Virginia doing excursions with the N&W 611. 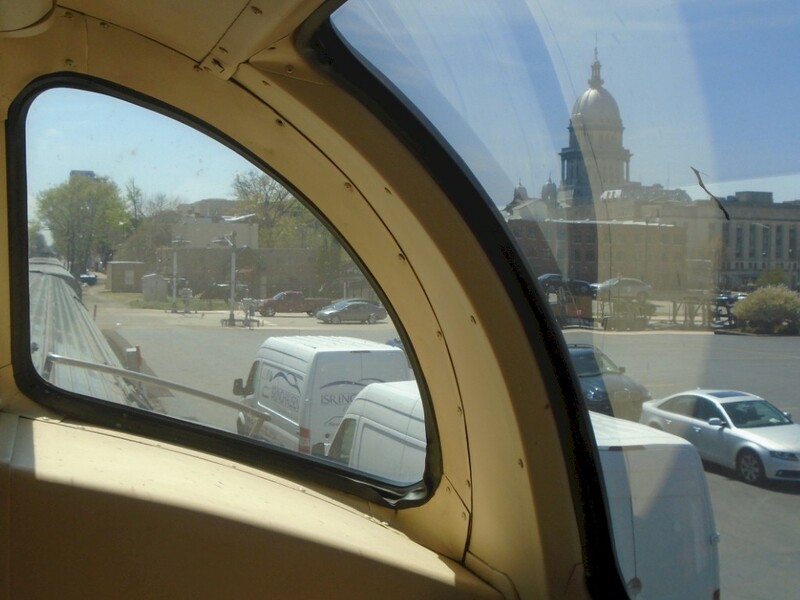 So, instead, we got “Sky View” for the trip to Saint Louis, an ex-Santa Fe Big Dome. Anyway, Robert Neil and Kandace helped Mike greet passengers in the Great Hall of Chicago Union Station, while Robert Tabern got everything set on the dome car. Set-up ahead of passengers getting on the train can often take some time. APRHF Rail Rangers own two wireless speaker systems which are used on our excursions; these were purchased by the APRHF for Trails & Rails, but they are used now for Rail Rangers. Wireless speakers let passengers on both end of the dome car clearly hear our narration, while the person doing the narration can freely move about the car. 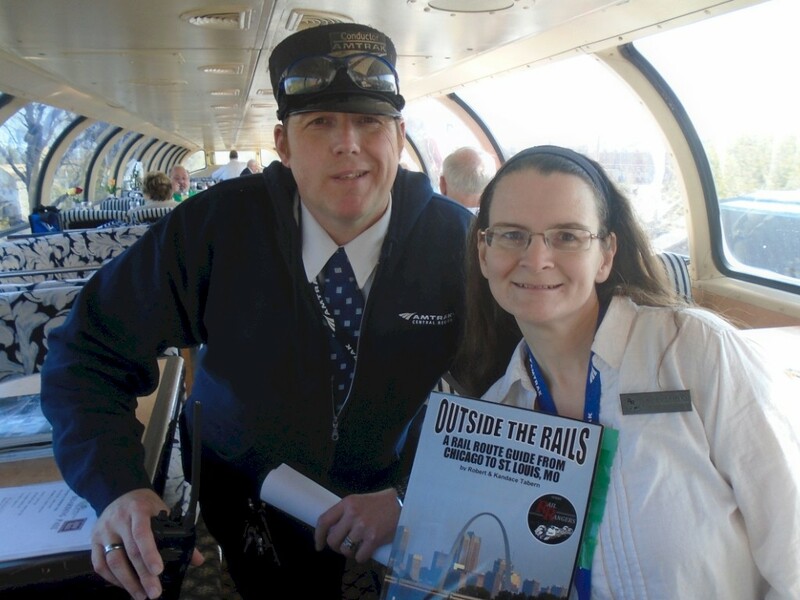 APRHF Rail Rangers has also partnered with Outside the Rails Guidebooks, which offered its Chicago to St. Louis route guidebooks for sale on this trip. This company is owned by the two of us, and the guidebooks were written from the notes that we took during the three driving research trips we did last fall. This is an excellent service that we are able to provide our private railcar partners. We have found that many private railcar owners and excursion organizers have a lot to worry about when it comes to the trips… and putting together a quality in-depth route guide often goes on the back burner. That is another advantage that private railcar owners have when they partner with APRHF Rail Rangers. Our volunteers put together the route guides so they can worry about other aspects of the trips. The Chicago to St. Louis route guidebook that we put together was over 100 pages long! Around 8:45am everything was in place, and passengers began to board “Sky View” for the southbound trip to St. Louis. Almost immediately after boarding, passengers were served a warm breakfast of scrambled eggs, bacon, cubed potatoes, and toast. We also began our narration rolling out of Chicago Union Station. The first 37 miles of the train route, between Chicago and Joliet, is on the Canadian National (ex-Illinois Central). Most of this portion of the route follows the historic Illinois and Michigan (I&M) Canal… and there are many sites to see and talk about. While many people may not have heard of the I&M Canal, it marked a major transportation milestone for the United States. Before its completion, if one wanted to travel between Chicago and New Orleans by boat, they would have to head east through the Great Lakes, up the St. Lawrence River, around the East Coast and Florida… and into the Gulf of Mexico. With the completion of the approximately 100-miles I&M Canal, boats were able to head directly down to St. Louis and New Orleans via the Canal and Illinois River. While boats don’t use the I&M Canal anymore, several of its locks and dams are still around. In fact, a few are even visible from the train line. There are also many refineries and other factories that we told passengers about. 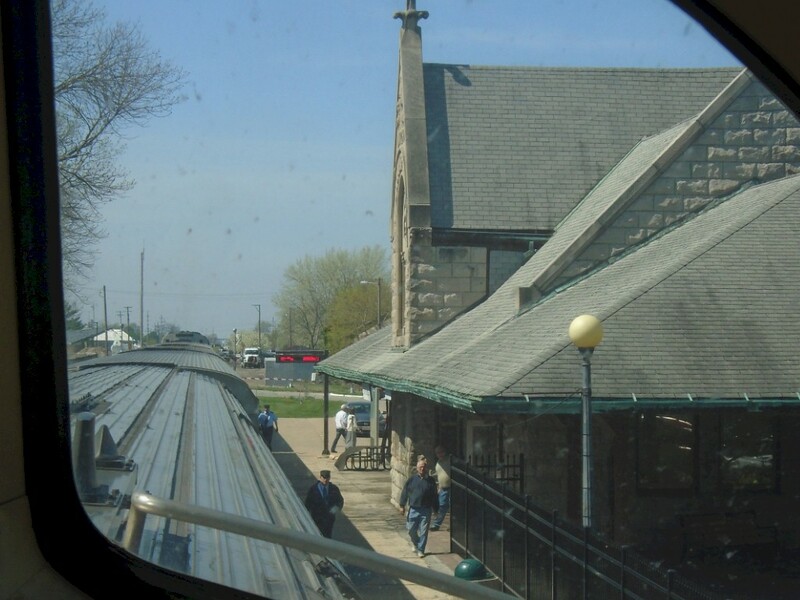 Around 10:30am, we pulled into Joliet Union Station. Amtrak recently closed the historic building and moved to a smaller station; the old building will be used for special events. Just north of Joliet, the route switches from Canadian National to Union Pacific. 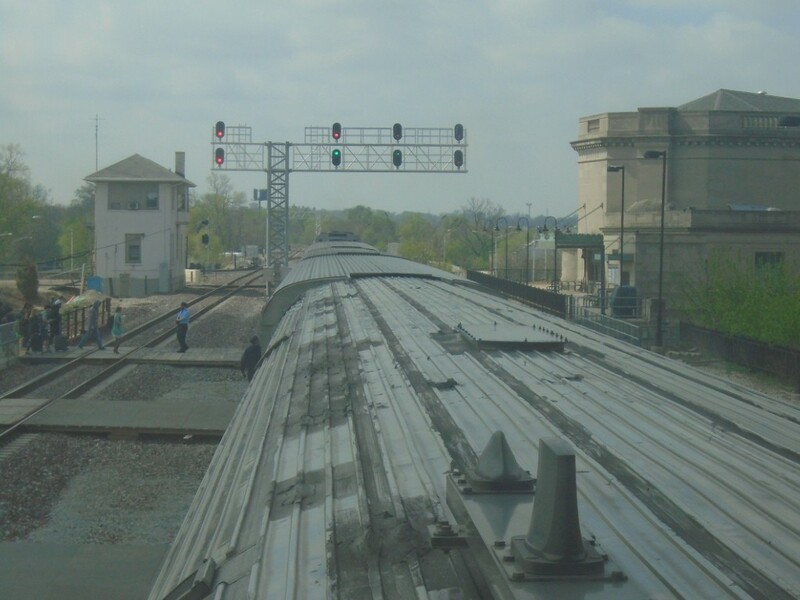 We stayed on the Union Pacific route all the way to St. Louis – except small stretches that are jointly owned by Norfolk Southern, Kansas City Southern, and the Terminal Railway of St. Louis. Three of the major themes of our presentation to passengers throughout the day were about Abraham Lincoln, coal mining, and Route 66. The train route between Chicago and St. Louis goes through Springfield, which was the home for many years of our 16th President. Many passengers found it interesting that Abraham Lincoln rode the very rail line that we were riding – both as part of his campaign for the Oval Office in 1860 – and sadly, for his funeral train between Washington, DC and Springfield, Illinois. Coal mining is a major industry in central Illinois. Interpretive Guide Robert Neil pointed out a four-mile-long coal conveyor belt that runs along the tracks; it’s part of the Viper Mine. If you are going southbound, it can be seen off on the left side of the train between Lincoln and Springfield. There are still many active coal mines the train passes through. Finally, many stretches of old Route 66 can be seen from the train route between Chicago and St. Louis. U.S. Route 66 was one of the original federal highways created in 1926; it ran from Chicago to St. Louis… down to Oklahoma City… across the northern part of Texas… through New Mexico and Arizona… before passing through Los Angeles and ending at Santa Monica Pier on the Pacific Ocean in California. It was immortalized by the television show and other media. Through the 1970’s and early 1980’s, many stretches of Route 66 were replaced by various Interstate Highways; in Illinois, it was Interstate 55. Since the interstate went around towns, and Route 66 went through towns, many stretches of the original highway can still be seen today. Viewing the old roadway bed is especially good from the train, since it was often built parallel to the tracks. These are just three of many topics that we shared with our passengers. Around 1:00pm lunch came out and was enjoyed by all – including choices of a cheeseburger, club sandwich, or chicken Caesar Salad – and a wide variety of drinks and desserts. If you have never been part of one of the excursions that APRHF Rail Rangers partners on, the meals are just as great as our narration. These are not your typical fast food, or even Amtrak meals. Chefs with Iowa Pacific prepare all meals from scratch onboard. Looking in the kitchen, we didn’t even see a microwave or convection oven to be had. Robert Neil and Robert Tabern both had the cheeseburger and commented to the chef how it was one of the best burgers they ever had. The chef commented that he and his co-workers actually grounded the meat by hand and rolled the hamburger patties out before putting them on the grill. Amazing service like this on a train exists today! But it works – it was one of the best burgers we’ve had in a long time. Kandace’s club sandwich was so huge she wasn’t even able to finish it! 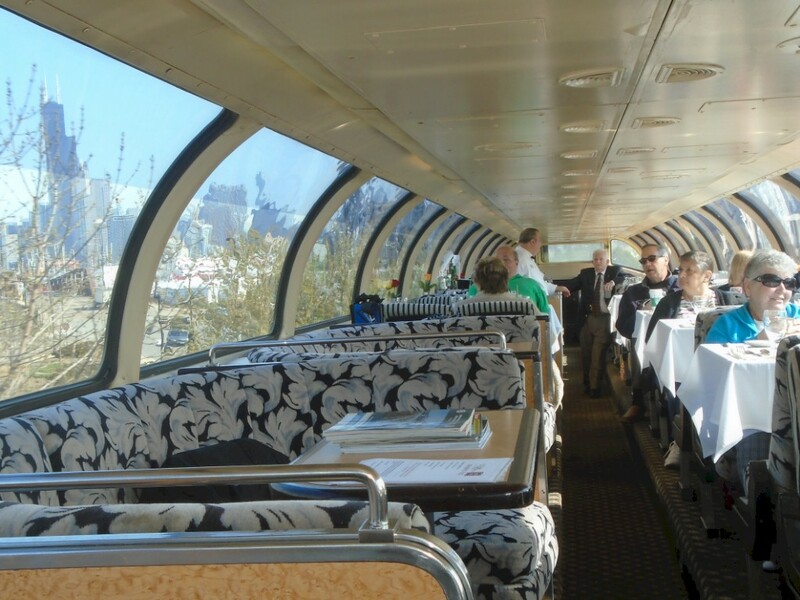 Not only are you riding in a historic 1950’s dome car – you are getting meals prepared fresh aboard like passengers in the 1950’s got to experience them. This is all part of the experience and makes it well worth the ticket prices that are charged for private railcar trips. Around 2:45pm we were crossing the Mississippi River and heading into Downtown St. Louis. We explained to passengers there were actually two different routes that Amtrak uses to access Gateway Station. One route goes over the Merchant Bridge – and the other goes over the MacArthur Bridge. It seems like most trains, especially recently, have been using the MacArthur Bridge. This bridge goes by the Gateway Geyser – the tallest water fountain in the United States. Three times a day it shoots water 630 feet high – the same height as the Gateway Arch right across the river. We explained to our passengers that the only other higher water fountain is located at the King’s palace in Saudi Arabia! 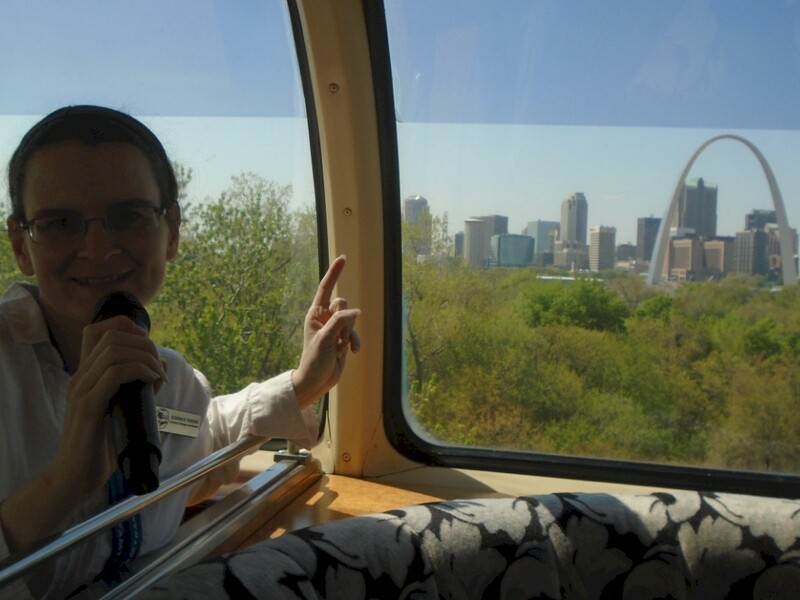 Going the MacArthur Bridge route – you also get a sweeping view of the St. Louis Skyline coming in. If the train would have taken the Merchants Bridge route – the train goes under tunnels under the Saint Louis Arch – you can look up and see the tallest monument in the United States out your window. The train arrived in St. Louis a few minutes early. Passengers were given a full 26 hour turn-around time to enjoy the sights of the city. Zephyr Route offered passengers an optional trolley tour of the city, while others headed out on their own to take a riverboat ride or buy tickets to go up on the Arch. It was also the hockey playoffs between the Chicago Blackhawks and St. Louis Blues – so there were also a fair numbers of our passengers who were going to hit the hotel and watch sports. Almost immediately upon getting all of our passengers off, the conductors came aboard “Sky View” to inform us that we could either get our equipment off now, or we could stay on for a bit and go around the wye with them. Who isn’t up for some “rare mileage”, so we stayed on the train and go to on the riverfront wye. Part of the wye goes through one of the tunnels under the Arch that we would have gotten to go through if we came in over the Merchants Bridge – so it was fun to have the best of both views. The train got back to the station around 3:30pm and “Sky View” was cut off from the rest of the consist – as it was going to be turned to go back to Chicago later that evening. The two of us, and Robert Neil, enjoyed our free time in St. Louis for the rest of the evening. We stayed at the Crowne Plaza St. Louis Riverfront, while the passengers who were part of the trip stayed at the hotel by the old Union Station. We had to wait a long time to check-in due to some high school and college dances that were going on at the hotel, but were rewarded for our patience with an upgrade to a full suite. We were sad to learn that the Crowne Plaza might be upgraded into condos sometime soon. We walked around the Arch Grounds for much of the afternoon – a lot of the park area is being torn up for a new visitor center that is being built (it will open in 2017). After a restful night’s sleep, we got on the northbound Texas Eagle to head home. Just four days after this APRHF Rail Rangers excursion, we had a major cross-country train trip planned and wanted to get home early. Passengers returned back to Chicago with Interpretive Guide Robert Neil the following evening on Train #306; it left St. Louis at 5:30pm and got into Chicago just after 11:00pm. Robert kept everyone entertained with additional stories that we did not share with them going north. A view of the Illinois State Capitol from the dome car windows of "Sky View"
If you missed this APRHF Rail Rangers excursion between Chicago and St. Louis, you are not totally out of luck. We have several other exciting events coming up later this summer and fall. On Friday, June 3, 2016, our interpretive guides will be on a private railcar excursion between Chicago, La Plata, Missouri, and Kansas City. 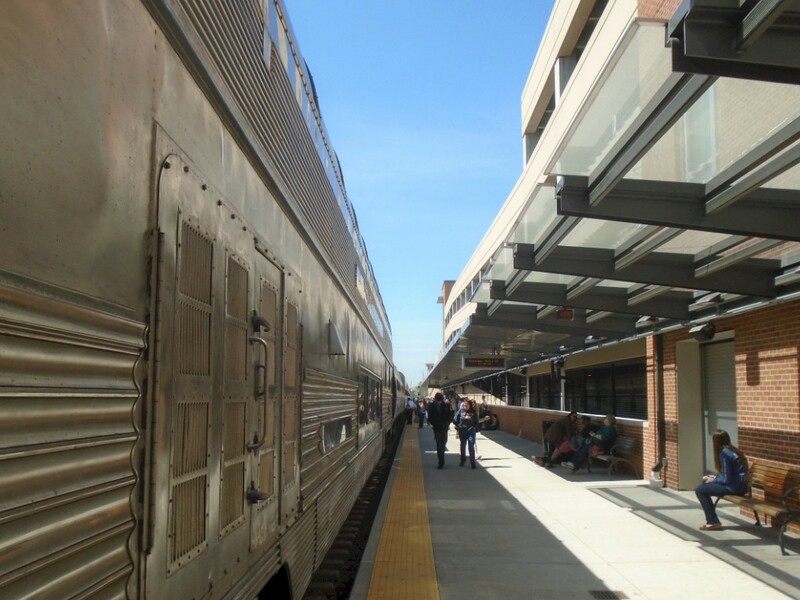 This trip is sponsored by American Rail Excursions; passengers will be going on a five-day tour of the “Iron Triangle” between Chicago, St. Louis, and Kansas City. For you steam engine fans, get ready to hit the rails with APRHF Rail Rangers on Saturday, June 4. 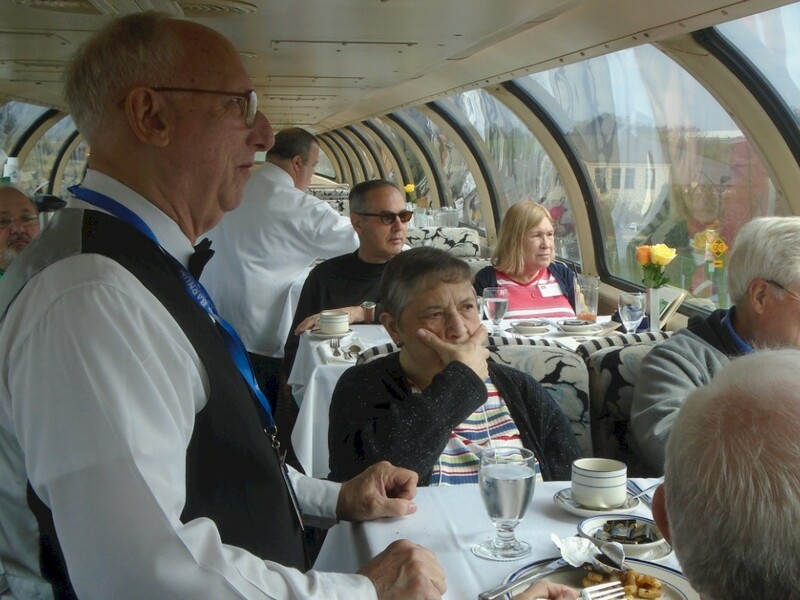 Our interpretive guides will be aboard selling custom-made route guides and providing narration services for Premium Class Passengers going from Minneapolis to Duluth, Minnesota. A third APRHF Rail Rangers event will take place in June. On Saturday, June 26, join our guides again as we travel on a Zephyr Route excursion between Chicago, Galesburg, and Quincy, IL/Hannibal, MO. Limited seating is still available for this trip – it is very likely to sell out very soon! The APRHF Rail Rangers will offer its keynote excursion of 2016 between Friday, September 9 and Sunday, September 11 – as a private car trip is planned to La Plata, Missouri for the first time ever. Participants will enjoy a 600-mile roundtrip rail ride through Illinois, Iowa, and Missouri, two nights at the Depot Inn & Suites, and a guided all-day tour of Northeast Missouri – ending with a cook-out along the tracks done by none-other than APRHF President Bob Cox and APRHF Vice-President Amy Cox. 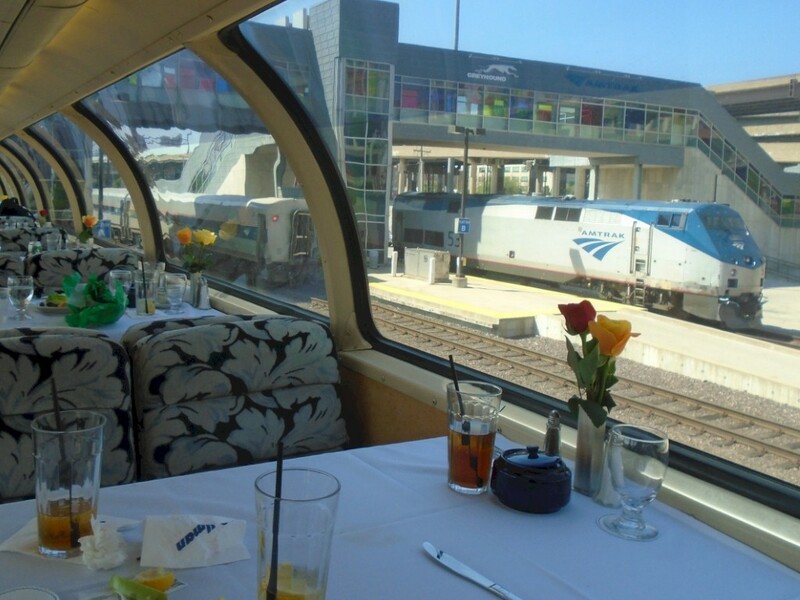 On Saturday, October 1st, APRHF Rail Rangers are partnering with the Friends of the Cumbers and Toltec to offer an open-platform lounge car excursion between Chicago, La Plata, MO, and Kansas City. APRHF Rail Rangers will also offer a fall colors excursion the second weekend in October between Chicago and St. Paul, Minnesota. As you can see, there are a lot of exciting events ahead this year for APRHF Rail Rangers. We encourage those interested to follow us on facebook at www.facebook.com/railrangers and check out our website at www.railrangers.org for an always “up to date” listing of our excursions and outreach events.